Main pageMeasurement-/ control technologyDensity and salinity measurementRefractometersaqua biotica Refractometer (T-compensated)Have You see this Product cheaply? I am interested in the article: Model-No. 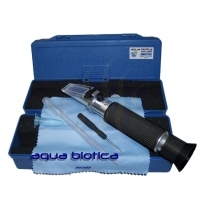 : 1795 aqua biotica Refractometer (T-compensated) However I saw this article at a favourable price with one of your competitors. Please you communicate to me whether you can undercut the article genanten above.